school to post­graduate and, from the Smithsonian Institution to the Kennedy Center. They educate while entertaining at schools, colleges and universities, hospitals, men’s and women’s prisons, youth correctional facilities, half­way houses, battered women’s shelters, synagogues, mosques, temples, churches, community centers, and corporations. Sounds of Blackness has partnered with corporations such as General Mills’ “Feeding Dreams” and United Health Care’s “Do Good, Live Well” programs, to support urban programs and people. General Motors, Northwest Airlines, Target Corp, 3M, IBM, A&M, American Family Insurance, the NBA, the NFL, CBS, Polygram, Disney, and NARAS. Sounds of Blackness has partnered with domestic violence agencies and actively participates in the struggle against domestic violence ­ through music. Pioneering the world­wide presence and proliferation of Inspirational Soul Music at radio, dance clubs, television, theater and on film –which has in turn substantially changed and continues to change the very face of each of those entities forever. Film soundtracks from Batman and Demolition Man, to Panther, House Party II, The Posse, Down in the Delta,Moses in Egypt, John Henry, First Kid, Mo’ Money, Justice, First Sunday, Precious, and The Apostle. The Sounds of Blackness music helped fuel the presidential campaigns of President Barack Obama. 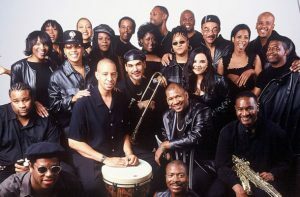 The group’s self-­titled CD The Sounds of Blackness and its first single “Fly Again” inspired the world and a new generation. The Sound of Blackness CD won a 2012 NAACP Image Award for Best World Music Recording! In 2015, “Black Lives Matter: No Justice No Peace” gave resounding voice and added depth to the powerful Black Lives Matter movement. Now, “Royalty” has topped the charts at #14 and is stirring a young generation to believe in their majesty and ability to change the world.